Latest design from PBOT. Note the prohibition on driving via 69th on the right. 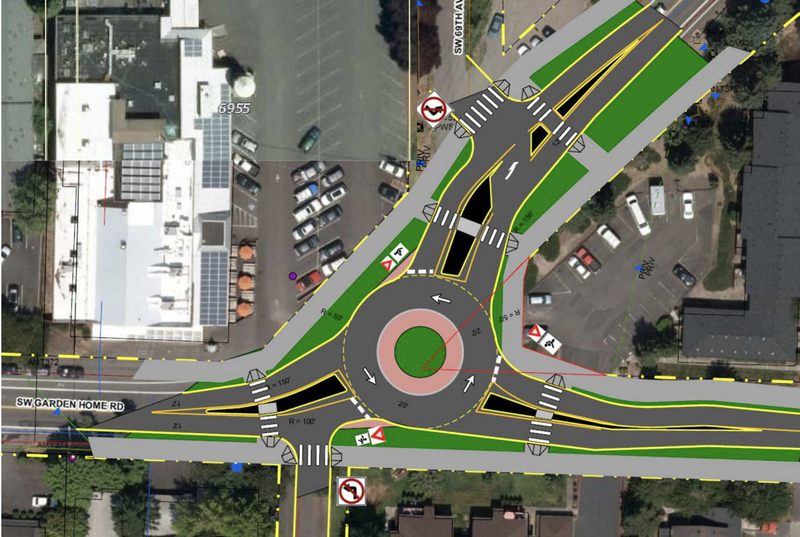 Unfortunately we posted our story on the City of Portland’s SW Multnomah/Garden Home intersection project one day too soon. This morning PBOT sent over the latest concept designs, which show significant changes from the designs many of you are discussing over on yesterday’s post. 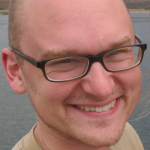 They’ve also just released an online survey to formally capture feedback. The two basic concepts we shared yesterday are still the ones under consideration; either a roundabout or a signalized configuration. But check out these new drawings before making up your mind. PBOT has supplied aerial and on-the-street views of each one. And make sure to note that both designs show PBOT’s proposal would close off the southern section of SW 69th while maintaining access only for people on bikes and foot. Half a mile south of the lonely riverside trail segment derided recently by The Oregonian as a “pathway to nowhere,” the city could miss a chance at a key connection. 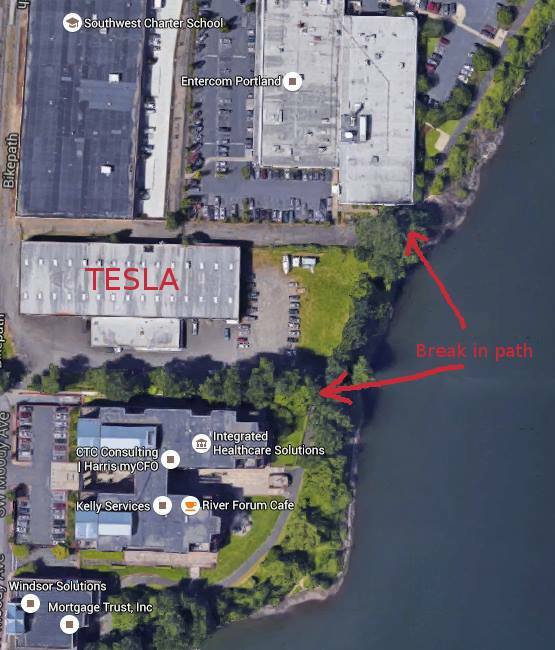 Last week, Tesla Motors filed an application to convert an old metal-parts warehouse between Macadam Avenue and the Willamette River into an auto showroom. But for people who would like to see a continuous riverside trail here, there’s bad news: a special section of city code exempts projects in the South Waterfront from having to connect greenway trail segments on their property unless they’re adding at least 50,000 square feet of new floor space. Because Tesla only plans to remodel the warehouse, not expand it, the unused space behind its shop wouldn’t have to redevelop. Concept art for a new bike-and-ride facility at the Goose Hollow MAX station, due to open by the end of 2016. 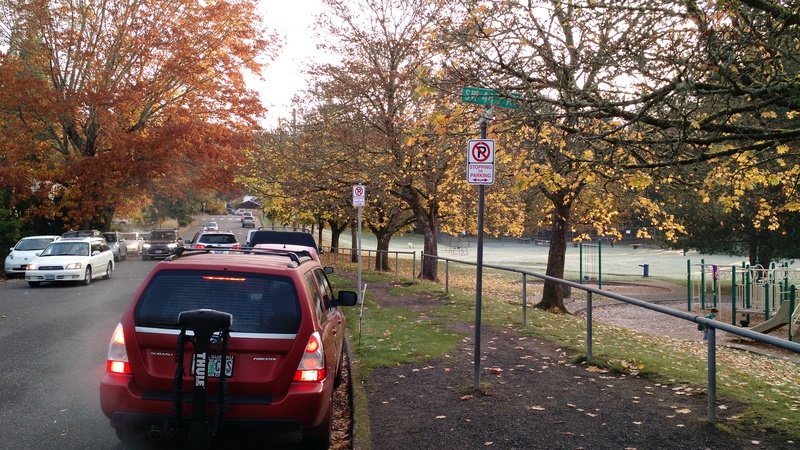 Portland’s regional transit agency expects to add new locked “Bike and Ride” facilities this year to its Goose Hollow, Beaverton Creek and Orenco Station MAX stops, greatly increasing the west side’s capacity for bike-to-transit commuting. It’s especially welcome news for MAX commuters through the crowded Robertson Tunnel between Portland and Washington County. Job and residential growth in Central Portland and urban Washington County have been leading to more and more people looking to reach those stations by bike. At at least one of the facilities, there’s even room being set aside specifically for cargo bikes. Almost half of southbound rush-hour traffic on Barbur turns right here. Converting the right lane to right-turn-only could boost driver safety on Barbur while making room for continuous bike lanes. 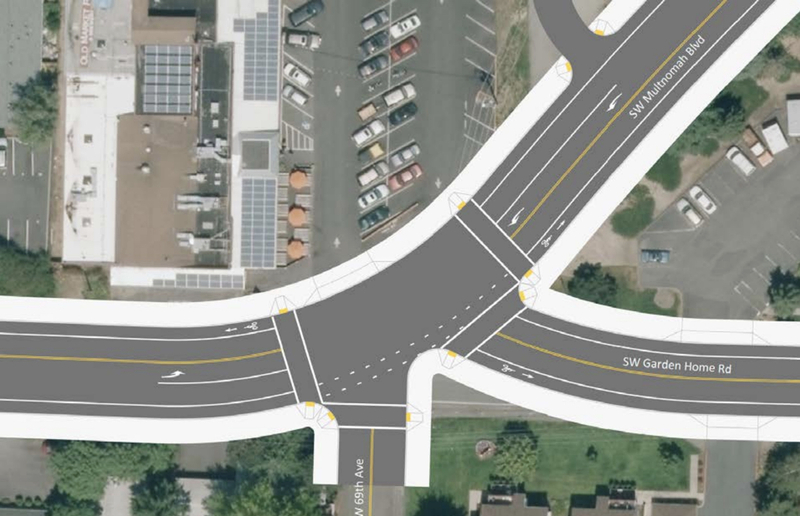 Buried inside 115 pages of analysis of Barbur Boulevard, a “safety audit” released Monday seems to have come up with something interesting: a pretty solid new idea for fixing the dangerous wooded section of Southwest Portland’s most important street. It’s fairly simple. Instead of losing a northbound auto lane from Miles to Hamilton, one of Barbur’s two southbound auto lanes could peel off at Capitol Highway. 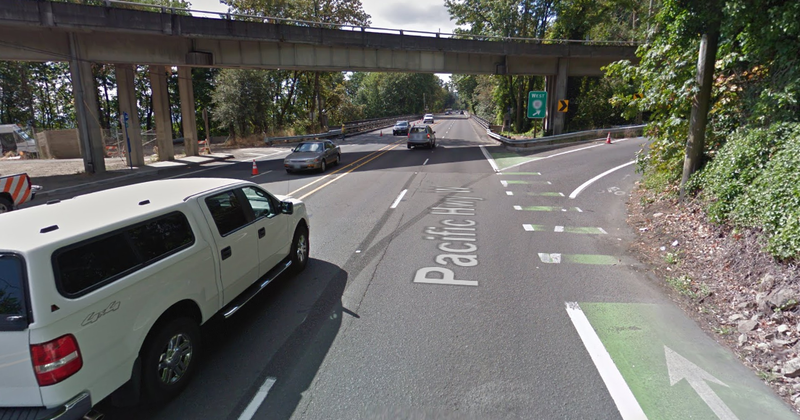 South of Capitol Highway — which is where 40 to 50 percent of southbound Barbur traffic exits anyway — the street could be restriped to add continuous bike lanes across a pair of narrow bridges, ending the current situation that pushes bikes and cars to merge into the same 45-mph lane. 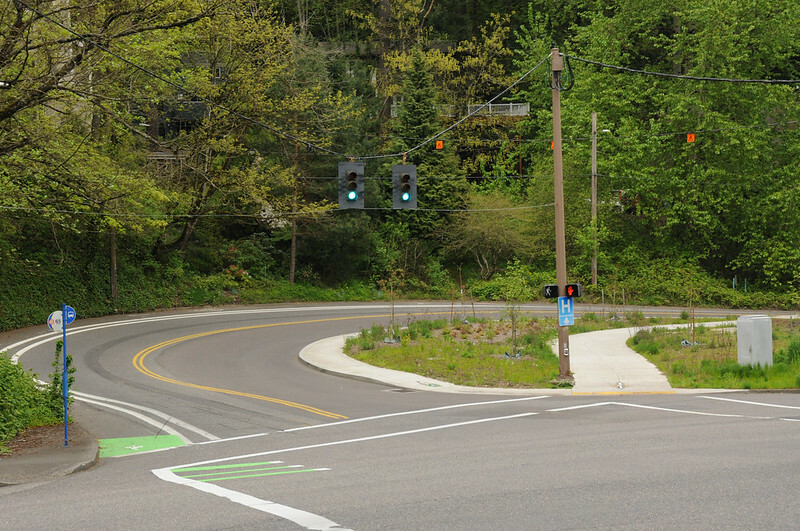 The new coloring and lane sorting makes things much more intuitive and comfortable for people biking and walking. 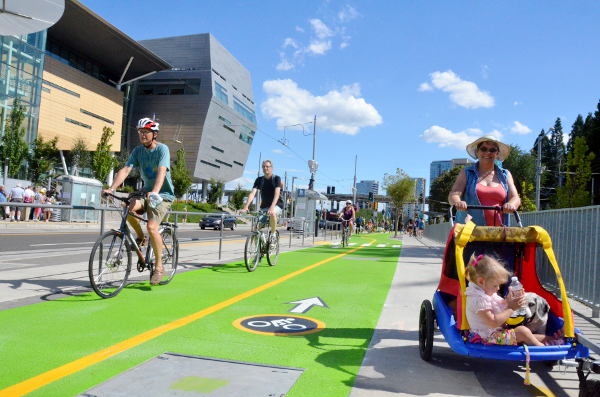 Just in time for Tilikum Crossing’s public preview last weekend, TriMet and the City of Portland unveiled a new design for the main street leading to the South Waterfront. In two words: It’s fantastic. Green dots are locations where the 2013-2014 average bike count was more than 10 bikes higher than the 2011-2012 bike count. Red dots are locations with a drop in 10 or more bikes. Yellow dots showed relatively little change. If the last two years of city bike counts tell any coherent story about biking in Portland, it’s this: Biking keeps rising in Portland’s bike-friendliest neighborhoods, but not fast enough to make up for declines in the parts of Portland where biking is often unpleasant. Typical midday traffic approaching a curve in Barbur Boulevard from the south. Four months after saying it had no plans to do so, the Oregon Department of Transportation will formally consider the possibility of new changes to a two-mile stretch of Barbur Bouelvard where six people have died in cars, on motorcycles and on foot in the last six years.